One of the questions that we've been discussing recently is the question of who should be able to see what in a multi-computer environment (e.g. a home or small office). Pros - This is familiar model. In a high-trust environment everyone can have administrator rights. In a privacy-conscious environment there can be one administrator and a series of limited users. For total privacy, each user should have their own account. Cons - There's no way, other than separate accounts, for a limited user to protect their data from the administrator. You can look forward to seeing this feature released in the next month or two! Once your files are on a remote server there are some really useful things that can be done with those files. 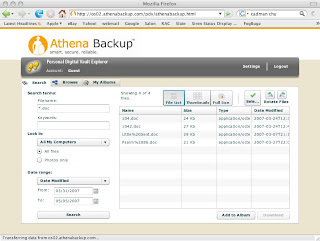 We've been working to get these capabilities out to Athena Backup users. Here are some of the useful new features that we're working on for Athena Backup. 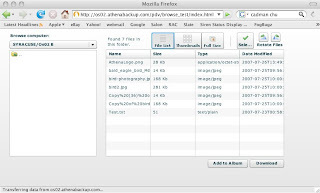 Basic file access can be provided via a web page. This is great to allow retrieve a specific file by drilling down through a set of folders when you're somewhere else (e.g. work) and you need to get a file from your computer at home (or vice-versa). Here's a screenshot of a prototype Athena Backup website viewing files. The next level of functionality is for the system to understand more about the files. Providing a search by file type and/or date, especially across multiple computers allows users to easily find the file they're looking for, especially when it isn't obvious where it is. 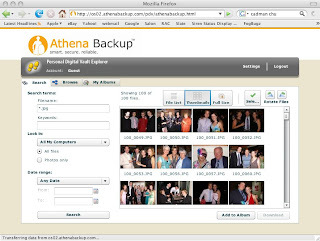 Here's a screen shot of a prototype of the web-based searching functionality for Athena Backup. All of these feature are planned for release next month. Stay tuned for more! 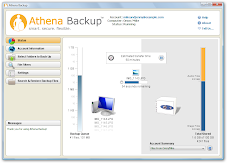 We've spend a lot of time at Athena Backup debating whether to offer unlimited storage. So, after much soul searching, we've decided to price Athena Backup at $4.95/month for 50 GB. Why 50 GB? We believe that 50 GB is a good amount of storage for photos and music. It provides clarity to our users and let's them manage their personal data. It let's us provide a great service and still be profitable without making people's lives difficult, either by cutting off their service or crippling their service. Now to see what users think! This is the first post of the Athena blog. The Athena blog talks about the Athena family of products - products which are designed to protect and share your personal files over the internet. I am Andrew McGregor, one of the founders of Bronze Age Software Corp., the creators of the Athena family of products. We're planning to use this blog as a place to present and discuss issues with the Athena products, including usability, new features and product direction. Stay tuned for more information!